Saturn - a division of the American concern General Motors, founded 7 January 1985 in the wake of the success of Japanese cars in the United States. During its short history Saturn was quite independent of the parent company - had its own assembly line in Spring Hill, Tennessee, as well as a separate retailer network. The official slogan of the company - «Different Kind of Car Company» ( «The automaker, unlike the other"). After the failure of the transaction to purchase Saturn group Penske companies in September 2009, General Motors announced the discontinuation of the cars of this brand. October 31, 2010 was the last day in the company's history. For the first time of: Saturn, as a revolutionary brand new, small cars talking in June 1982. Finally, the idea of the brand has been formed by the end of 1983 and released the Board of Directors Chairman of the GM - Roger Smith (Roger B. Smith) and president of the group - James MacDonald (F. James McDonald). 12 months later the first car under the brand Saturn was collected. Officially, the company was founded January 7, 1985. In July 1990, the chairman of board of directors GM - Roger Smith, and President of the United Auto Workers - Owen Bieber (Owen Bieber) drove the first coming down the assembly line in Spring Hill, automobile Saturn. Company indicators were mixed. According to The Wall Street Journal project was too ambitious. Despite the fact that the Saturn brand cars were very popular among the customers, the number of cars sold was excessively low compared with the optimistic forecasts, in particular because of the market downturn in 1990. This fact caused discontent in the ranks of the board of General Motors. It turned out that the production of Saturn vehicles more expensive than the discovery of the plants of Japanese automakers in the United States. However Saturn S-Series in demand. In 1991, the cars of this brand come to the Canadian market. 500 thousand cars (half a million cars called Carla (Carla)) has been sold by 1993. By May of 1995 one million vehicles (cars jubilee was named Jasper (Jasper)) was sold. In 1996, the year on sale there was an electric Saturn EV1, which 10 years later became the subject of the documentary "Who Killed the Electric Car?". Almost all the EV1 were recalled and destroyed by GM in 2005. In 1997, Saturn entered the Japanese market. two million cars were assembled By 1999. A year later, Saturn began production of the new Saturn L-Series. The first compact all-wheel drive wagon was the Saturn Vue, put into production in 2002. In 2003, to replace the outdated S-Series came Saturn Ion. In 2005, we began selling minivan Relay. In the same year the production of L-Series has been discontinued. Saturn Sky roadster was unveiled in 2006. In 2007 Aura sedan reached dealerships, along with Outlook, more spacious crossover than its predecessor Vue. 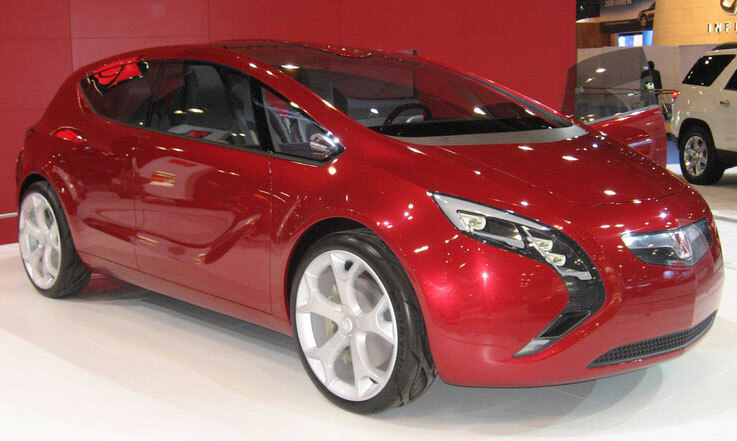 At the North American International Auto Show 2008 Saturn brought the concept car Flextreme. December 2, 2008 at a meeting of representatives of the US Congress General Motors announced their intention to develop and maintain the 4 major brands (Chevrolet, Cadillac, Buick, GMC), thus abandoning the Saturn, Pontiac, Hummer and Saab. In February 2009, GM announced the decision to leave the mark. In June of the same year the concern has announced the possibility of selling the Saturn group of companies Penske. 30 September 2009 negotiations on the sale stalled. In the long term it is not excluded that the brand << Saturn >> can be restored.